So many brides I meet and speak with each day are frustrated, some even freaking out as their wedding day draws near. Here’s what’s usually going on behind the scenes: You’ve found the dress of your dreams, but you can’t decide on how to accessorize it. Everyone has an opinion-and everyone is willing to share. Such well-intentioned advice can drive you crazy! No one teaches courses in "Bridal Accessories 101," so it’s hard to rely on Mom’s or your best friend’s judgments — especially when no one agrees. No wonder the months leading up to the big day are turning you into a chain-smoking, nail-biting wreck! It’s the most important day of your life — the day all eyes will be trained on you as you walk down the aisle — and you’re afraid to trust your instincts and inner voice. That’s where I come in — and it’s a role I adore. I watch trends and work as part counselor, part stylist to help each bride-to-be find just the right look. My goa. To make sure your inner glow shines through. Here are some tips to help you stay sane and accessorize with flair. Think of your gown as a stage, and all of the accessories you select are the actors and scenery that create a smash hit. You chose your gown because it called out your name and represents who you are. Regardless of whether its style is vintage, traditional, modern or eclectic, it serves as the backdrop for the jewelry and accessories you buy. Follow your gown’s motif. If, for example, your dress is adorned with radiant crystals, select jewelry with matching accents. The same goes for gowns with beading or pearls. With taupe and gold embroidery a popular feature on this season’s gowns, opt for necklaces and earrings set in glittering gold. Shine the Spotlight Jewelry adds sparkle and pizzazz — the much-needed "wow" factor. You’ll use it to draw attention to your best features: eyes, cheekbones, .colletage, neck, hair. You know which features your fian. swoons over. Accent your gown by playing up these areas with the right jewels. Before deciding on earrings, talk to your hairstylist about how you’ll wear your hair. Bring your dress to the salon several months before the wedding so the two of you can come up with a plan. This will give you time to grow out your layers or bangs, if necessary. Once your hair plan is in place, it’s time to shop. If you’re wearing a traditional updo–a chignon, French twist, Juliet knot or similar style–drop earrings add drama. For short hair, chic pearl or cubic zirconia studs or buttons are extremely popular. And if your long, loose-flowing tresses will be accompanied by drop-dead-gorgeous chandelier earrings, don’t overpower them with a necklace. Less is definitely more! If your dress is backless, a lariat necklace that cascades down your spine is a breathtaking accessory, and earrings should be subtle. Make sure your headpiece matches your jewelry. A tiara composed of solid rhinestones will overpower delicate pearl jewels. And if you’ve chosen modern jewelry dripping with cubic zirconia, a pearl headband will be too coy and traditional. 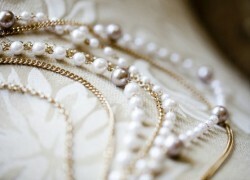 Most importantly, remember that you wear your jewelry and headpiece – they don’t wear you. Choose pieces that are perfectly suited to your gown and personality. 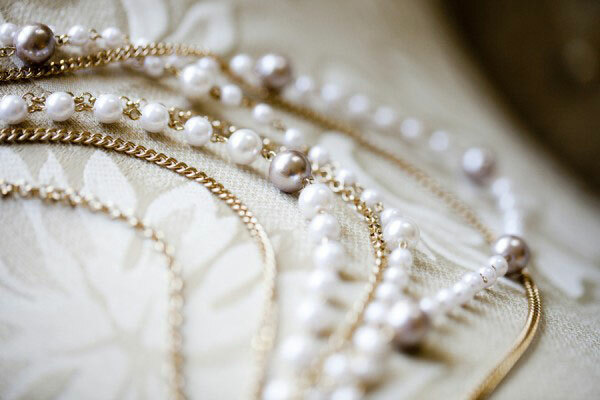 If you’ve never been a fan of pearls, your wedding day isn’t the time to flaunt them. You’re creating a pleasing package, so make sure everything works together. Terrie Needham owns Anna Bellagio, a leader in the bridal jewelry and accessories industry for 17 years.